The nature of fantasy football lends itself to a unique relationship between the average Joe Schmo Fantasy Footballer and an analyst who studies the fake sport for a living. While the masses each play the same game that the analyst does, the relationship is one-sided; the paid forecaster studies player situations and statistics, synthesizes this information, and then conveys it all – typically in an article – to the Joe. 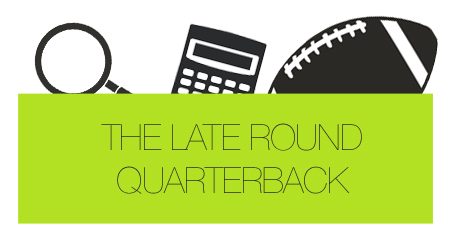 Entering 2012, plenty of high-profile analysts recommended a strategy of drafting elite quarterbacks as early as possible. The idea made sense during a time in which the running back and wide receiver positions were slightly more volatile, and when stud quarterbacks were consistently giving you top-notch performances week after week. Quarterbacks, to put it another way, were beginning to provide greater consistency week-to-week (ergo, they underperform less frequently). When you could have a (supposed) guaranteed 20 points per week, why would you not want to invest in a player that gives you that sort of consistency? Just last year, I was looking through Yahoo!’s draft kit. The kit was based around the aforementioned strategy and advocated grabbing Drew Brees, Tom Brady, and Aaron Rodgers at any point that Arian Foster, Calvin Johnson, Ray Rice, and LeSean McCoy became unavailable. The kit explained that, after those players, an elite quarterback would be the most valuable player to draft. The argument made a lot of sense, but just because a strategy makes sense, does that mean it’s the best? I’m not here to argue whether or not this is the best way of handling your draft, but I am here to discuss something that is missing in parts of the fantasy football world: A self-critical attitude, geared toward evaluation and improvement. What if we we’re wrong? What if we don’t have the best strategy? When you refuse to look at alternatives and ask questions, you’re doing yourself a disservice. Many innovations in business began with a simple question. Take Netflix, for example. Before 1997, the video rental industry was ruled by Blockbuster, while other, smaller companies had established their own neighbor niches. All of these companies had steep late fees that were levied against customers who returned videos past their due date. Reed Hastings (Netflix founder and CEO) posed a simple question; “What if a video rental company didn’t charge late fees?”. So, he created Netflix as a video rental company that wouldn’t charge these fees. To make a long story short, Netflix became wildly popular and Blockbuster went bankrupt. I’m sure that most of you know this story, but the important part is that Netflix was formed out of asking that simple question. It was Hasting’s willingness to ask questions that changed the video rental industry forever. This is not the only story of its kind. A quick Google search will return a plethora of stories involving people questioning the status quo and asking unconventional questions. It’s hard for me to ask these questions because I might discover that I was wrong. Sometimes being wrong is terrifying because being wrong usually comes with a sense of failure. I don’t know about you, but for me, there is a short list of things that I detest more than failing. Failure has been a major sticking point in my life. There have been a lot of times that I didn’t say something simply because I didn’t want to be wrong. I was scared that people would lose respect for me if I was consistently incorrect and I didn’t want people to think of me as a failure. Once I realized that my actions were being dictated by my avoidance of failure, I also realized that I needed to change. The first step in changing is realizing the difference between being wrong and failing. Failure is the lack of success; it is not simply an instance of being wrong. Just because you happened to be wrong doesn’t mean that you failed, and it certainly doesn’t mean that you weren’t successful. In fact, I would argue that the realization of being wrong is quite the accomplishment. So why is this on a fantasy football website? Well, it might seem like this article is just an excuse for me to rant about my problems. I promise you, this isn’t the case. The point of this article is to get you to think about “why”. How many things do you accept without a second thought? There are several “truths” in fantasy football that many gamers treat as gospel, even though they could potentially hurt their chances of success. I put the word “truth” in quotes because some of these strategies and nuances are assumed to be true, regardless of actual results. These gamers live and die by the “truths” that have been touted by analysts as the “secret”, “key”, or “solution” to fantasy success. One common “truth” is that you need an elite quarterback on your roster, but we’ve clearly already talked about this one. Another “truth” that is less common, but still very present in some circles, is that you need to reach for the “elite” defenses and kickers prior to the final few rounds of a standard redraft. Some of you might be reading this, appalled that your fantasy brethren subscribe to these truths, but you have to realize that, for them, it’s not that crazy. Some guy out there drafted San Francisco’s defense in the 9th round of 2011 and won his league. Now, consciously or subconsciously, this guy creates a connection between his 2011 roster and fantasy football success. This logic can completely deter your fantasy success. For the purposes of this example, let’s use the guy (mentioned above) who drafted the 49ers defense. He tested a hypothesis by drafting the players on his roster, and the results of the hypothesis were fantastic (he won his league). Now, he believes that he needs a strong defense in order to secure his next championship win. Because his hypothesis was successful for one season, he believes that it will be successful again. This is a logical flaw called “Argument from Ignorance”; one of the many types of Informal Fallacies. Argument from Ignorance refers to a situation in which someone assumes that a claim is true (or false) because it has not been proven false (true) or cannot be proven false (true). For the fantasy owner in this example, his claim is that he won a league title because of the points that he received from playing San Francisco’s defense and special teams. There’s no way to prove that this is false, even though there were certainly other factors that had an effect on his success. In this guy’s mind, it seems like his claim is true because it can’t be proven false. He feels that he won’t win another title if he doesn’t replicate the team from 2011. So he targets San Francisco, and other “elite” defenses, incredibly early in drafts. I hope you can see that this logic is incredibly flawed. Unfortunately, there are fantasy enthusiasts who make this mistake every year. I’m not the first person to break ground on this topic. I was inspired by great writers who challenged ideas that were considered “best”. Have you ever thought about why you use a scoring scheme or why you use certain league settings? Late Round Quarterback author JJ Zachariason wrote an article a few months ago that asked the question, “Is it possible to remove luck from fantasy football?”. If you read the article (which you should, lazy), you’ll see that JJ dives deep into how different scoring schemes and league settings can affect your success. His answer is that while you can’t fully eliminate risk, you can do things that help mitigate risk, which should be a primary goal for any fake footballer. But if everyone is a sage, no one is. The line between pro and amateur isn’t just blurred here. It doesn’t exist. Although this trend is more obvious in the context of a convention, this is an incredibly relevant theme in fantasy football. The second article continues the narrative by comparing fantasy football to blackjack. You’ll find that both articles challenge the idea of “elite classes” in fantasy football. San Francisco has a really good defense, but for the purposes of fantasy football, are they worth a 9th round pick? Are they really irreplaceable? JJ and Denny have their respective strategies and both challenge traditional ideals of fantasy football history. They’re great examples of analysts that are asking tough questions. They ask questions like “How replaceable is Tom Brady?” and “How successful can a fantasy team be while playing a cheap defense that has a good matchup?” I’ve seen a lot of people respond to these questions with a defensive and stubborn attitude. If these questions make you angry, I want you think about why they grind you gears. Is it so preposterous that someone might have a better strategy, or at least a strategy that we can benefit from? Are we willing to be bullheaded to the point that we’re really just hurting our chances of success? Despite any indication, this article is not here to advocate for a certain strategy. It’s here to advocate for self-evaluation and for the questions that are hard to ask. It’s possible that I’m making something out of nothing, or that I’m over thinking a concept that doesn’t really matter. I guess I’ll leave that up to you. You’ll never know if there’s something better out there if you never look for it. In a game where a small advantage can make a huge difference, why wouldn’t you seek out strategies that give you that advantage? Regardless of how many times you’ve won your league, stagnation will always lead to losses. Don’t become stagnant. Always question the status quo.